Our museum houses an extensive collection of railway relics of all kinds, working steam and diesel locomotives, carriages, wagons, historic buildings and one of the largest collections of railway signalling equipment open to the public. 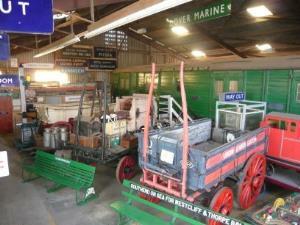 Where possible items from the collection are displayed in the appropriate setting, for example in the restored station masters office at Mangapps station and the Lamp Hut. The vast majority of the collection may be seen under cover inside the Museum building. We offer train rides through pleasant countryside. Special events include Santa Special trains during December. Open Saturdays, Sundays and Bank Holidays from 11:30 a.m. to 5:00 p.m. The first train departs each day when we are open at 12:15 p.m. ( 13:15 p.m. in December) and then hourly until 16:15 p.m. (more frequently on event days). Diesel Days £8. Senior citizen £7. Child £3.50. Under 3 years free. Steam Days Adults £9. Senior citizen £8. Child £4. Under 3 years free. Tickets include museum, lineside walk & train rides.